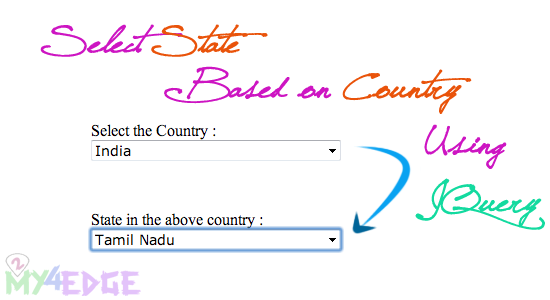 It’s for choosing state and city based on choosing the country, when we choose a country, in a second select option field will show the states, what are all presents in the country, that is the concept. Let see how it works. like the above image sample, when we choose the country, we can automatically show, what are the state are the in the country, for that we are using this code and script. thank u sir...Thanks a lot...This is Owesome job.. Thanks for the code..i need city drop down also..could be update the code with it. Nice code sir, but how can i use it multiple on a page. Thank you sooo much, you saved me. My next approach for this is to either explode your data in the js to migrate countries and cities to my database or find a countries and cities database and format the data same to your js. Any way to get code for cities? Great tool! I've been looking for something like this that isn't too complicated to understand and set up. I can edit the code myself and it works great!!! Thank you! Box account Band width limit is exceed. Copy that code, We will do the needful as soon as possible. Download link errors are fixed. Now you can download.